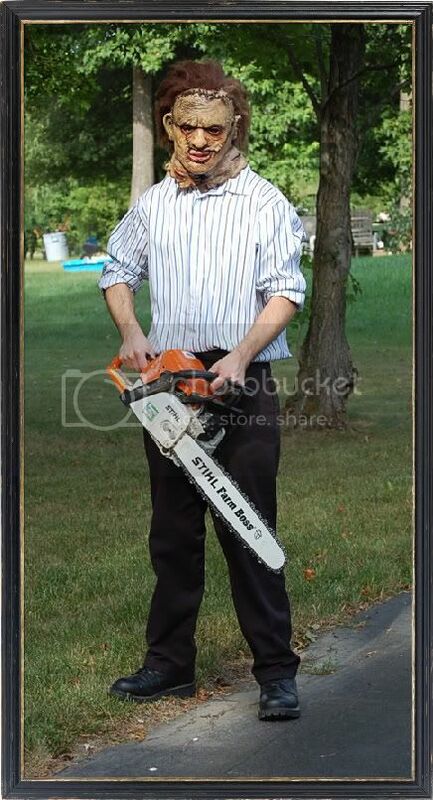 *Note* The chainsaw is not the one I will be ung, it's my dad's that I borrowed for the pics. The shirt probably won't get weathered (other than any natural dirtiness) nce I am no good at weathering. nice, ima put one togethe rtoo, i want the mr.skinnster mask. whhats yours? I love the mask! I'd definately weather up the shirt and pants a bit and maybe you should wear like a sweatshirt or a few under shirts just to beef up a little. Leatherface is a bulky big dude! I love the mask! I'd definately weather up the shirt and pants a bit and maybe you should wear like a sweatshirt or a few under shirts just to beef up a little. Leatherface is a bulky big dude Yea and an apron with blood staines! I'll be buying the gauntlets and apron from my friend Hunter next month at Monster Mania. Looking good, Matt! Can't wait to see the finished costume! Almost there. I will be picking up the armbands and apron from Hunter next weekend at Monster Mania and then all I need is a tie and I believe it is done. Looks great man, the clothing is very nice... I can't wait to see it completed.